Home › Email Scams & Phishing › Omniquad warns not to fall for the London “2012 Olympic” Email Scam fraudulently evoking both the Games and their Sponsors. Omniquad warns not to fall for the London “2012 Olympic” Email Scam fraudulently evoking both the Games and their Sponsors. 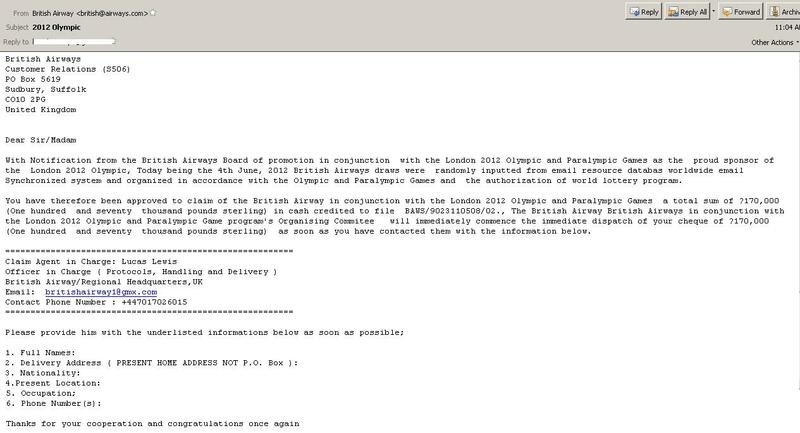 British Airways and London Olympics 2012 used as bait for Email Phishing Scam. The London Olympics 2012 has been targeted by various scams, but one of the latest scam attempts is following the script of your good old “lottery scam”. The scammers are using both the name of London 2012 Olympics, and reputable British Airways to try make their scam look legitimate. The scam email is a notification that the user has been awarded 170,000 pounds in a lottery program piloted by the “British Airways Board of Promotion” in conjunction with the London 2012 Olympic and Paralympic Games. As a sponsor of the London 2012 Olympic, British Airways has picked out random email addresses in an email lottery program, it has subject “2012 Olympic”. The want the victim to supply their personal information such as Full Names, Delivery Address, Nationality, Present Location, Occupation, Phone Number(s) for immediate dispatch of winning price cheque of 170,000 pounds. Once you contact the agent/reply to his or her email, you will be asked to pay some fees towards processing fees, taxes, couriers fees etc… in order for the winning amount to be released. The email is of course a scam. You cannot win a prize unless you have actually bought a ticket. There is no such thing as ‘email/phone number’ draws. Lottery scams often come from free email account like yahoo, hotmail etc. Never respond to spam / suspicious email or emails from unknown senders. Do not click on any link from the email. Do not open any file attached to the email. Do not supply your personal / Bank account information to strangers, they are most likely scammers. We have seen many different examples of such scam mails, next time the mail text/offer and approach of the sender may be different. The sender will claim that the mail is from one of the Olympics sponsors or well known organization associated with Olympics, such as in this case, British Airways. Hi I have replied to the London scam and gave my selphone number and initials and surname. If they ask anyting further I would not respond. Should it be a problem that I gave my selnumber and initials and surname? Hi, We cannot advice on any individual case. Consider if you for example inadvertently gave these details to a scammer on the street – you need to judge the risk yourself. A criminal has your name and phone number, and maybe also your email address? You need to consider carefully what a criminal could do with this information, and whether they can find out more details about you from this.